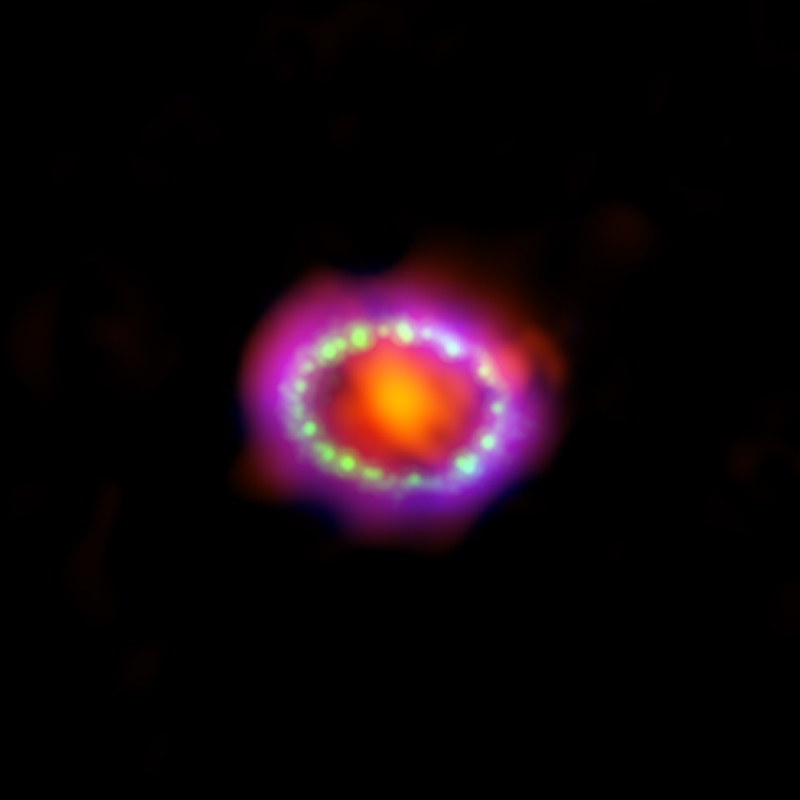 The 30th anniversary of the discovery of Supernova 1987A (SN 1987A) is being commemorated. SN 1987A was the brightest supernova seen in over 400 years and relatively close, allowing for detailed studies by many telescopes. X-rays from Chandra show the blast wave from the original explosion as it has plowed into a ring expelled by the pre-supernova star. The latest data reveal the blast move is moving past the ring into a region of space poorly known by astronomers. Using Chandra data, astronomers have created the first 3-D model and simulations of SN 1987A. To commemorate the 30th anniversary of Supernova 1987A (SN 1987A), a new package of material consisting of images, time-lapse movies, an animation, and a printable three-dimensional model have been released. 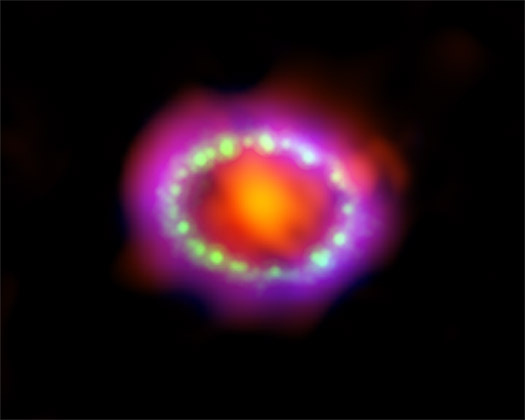 The remains of SN 1987A are entering a new era, as explained in our press release. 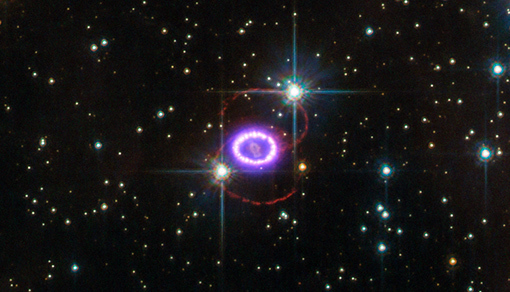 SN 1987A was first seen in the Large Magellanic Cloud by observers in the southern hemisphere on February 24, 1987. It was the nearest supernova explosion seen in modern times and provides astronomers the best opportunity ever to study the phases before, during, and after the death of a star. A new composite image contains X-rays from NASA's Chandra X-ray Observatory (blue), visible light data from NASA's Hubble Space Telescope (green), and submillimeter wavelength data from the international Atacama Large Millimeter/submillimeter Array (ALMA) telescope in Chile (red). The latest data from these powerful telescopes indicate that SN 1987A has passed an important threshold. The supernova shock wave is moving beyond the dense ring of gas produced late in the life of the pre-supernova star when a fast outflow or wind from the star collided with a slower wind generated in an earlier red giant phase of the star's evolution. 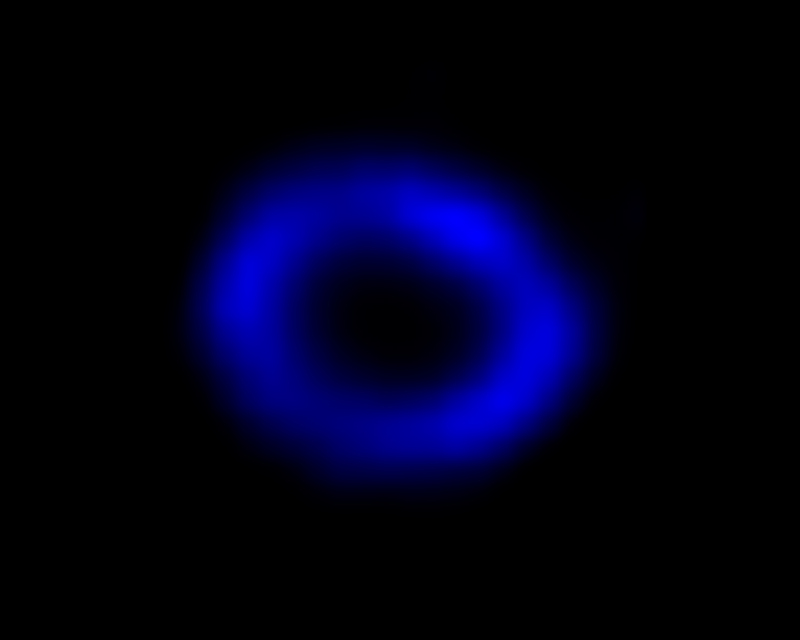 What lies beyond the ring is poorly known at present, and depends on the details of the evolution of the star when it was a red giant. Chandra began observing SN 1987A shortly after its deployment in 1999, while Hubble has repeatedly observed SN 1987A and been accumulating hundreds of images since 1990. ALMA, a powerful array of 66 antennas, has been gathering high-resolution millimeter and submillimeter data on SN 1987A in recent years. From 1999 until 2013, Chandra data showed an expanding ring of X-ray emission that had been steadily getting brighter. The blast wave from the original explosion has been bursting through and heating the ring of gas surrounding the supernova, producing X-ray emission. In the past few years, there have been striking changes in the Chandra data. From about February 2013 until the last Chandra observation analyzed in September 2015 the total amount of low energy X-rays has remained constant. Also, the bottom left part of the ring has started to fade. These changes provide evidence that the explosion's blast wave has moved beyond the ring into a region with less dense gas. This represents the end of an era for SN 1987A. In addition to this composite image, several other new visual items are being released. This includes the first three-dimensional model and animation of SN 1987A that links the supernova to its remnant, made possible by modeling and simulations done by Salvatore Orlando of INAF in Palermo, Italy, and colleagues Marco Miceli (University of Palermo), Fabrizio Bocchino (INAF/OAPA), and Maria Letizia Pumo (INAF/OAPA). This work has been published in The Astrophysical Journal and is available online. A paper describing the latest Chandra study on SN 1987A, led by Kari Frank of Penn State, appeared in a recent issue of The Astrophysical Journal and is available online. The other authors are Svetozar Zhekov (Institute of Astronomy and National Astronomical Observatory, Bulgaria), Sangwook Park (University of Texas), Richard McCray (University of California, Berkeley), and Eli Dwek (Goddard Space Flight Center). Coordinates (J2000) RA 05h 35m 28.30s | Dec -69° 16´ 11.10"
It is beautiful work. It is a work of art in the universe, and a great accomplishment for science, we will understand supernovas much better. I hope that this work would have more exposure in general, there are still doubts about the nature of the universe. Thank to all that trough their work advance astronomy. A very bright supernova seen in the Large Magellanic Cloud. About 168,000 light years from Earth. Combines X-rays from Chandra X-ray Observatory and optical/infrared data from other telescopes. About 14 light years across. X-rays are blue. Optical is green. Millimeter is red.